You found the place for the latest Cracker Barrel menu prices. Cracker Barrel Old Country Store is a combined gift store and restaurant known for its Southern theme and comfort food. Cracker Barrel offers traditional menu items for breakfast, lunch, or dinner plus seasonal selections and a kids menu. There are over 620 Cracker Barrel locations in 42 states so there is bound to be one near you. Several food items on the menu are Southern-inspired specialties like half-pound bacon cheeseburgers, Homestyle Chicken, and grilled pork chops. Cracker Barrel hours of operation are from 6:00 am -10:00 pm, closing one hour later on Friday and Saturday. Below are the latest Cracker Barrel menu prices. Looking for a one-size-fits-all gift. Consider a Cracker Barrel gift card. Whether you purchase a traditional gift card or an e-gift card, your loved one will receive all the joys of country comfort. Traditional gift cards are sent via postal service. E-Gift cards are sent to the recipient’s email inbox almost immediately. Cracker Barrel regularly promotes and sells a varied selection of CDs from musical artists and bands. Whether it is a new artist or legendary band, Country, or Pop, Cracker Barrel supports them all. Each Cracker Barrel location also features a country store. You are sure to find furniture and home items, apparel and fashion accessories, music/movies/books, collectible knickknacks, and food items. You can also shop online. No need to fret if you can’t visit your local Cracker Barrel location. Let Cracker Barrel help out with two convenient options. Call in your order for your Cracker Barrel favorites and set a pick-up time. Stop by and pick it up. Feeding a larger group? Check out the country-sized complete meal for six. Some of Cracker Barrel’s favorites ready when you need them. Love to read? Sign up to receive the Cracker Barrel newsletter and you will be one of the first to learn about new developments in the kitchen and general store. The foundation awards grants to support local and national programs that focus on education, opportunities for minorities, low-income families, & children, the environment, and strengthening the bonds of military families. Being a Cracker Barrel employee is a great way to put your people skills to work every day. Since the beginning, Cracker Barrel has been focused on ensuring that guests have an enjoyable experience. The same holds true for team members. Visit the Career page at the official Cracker Barrel website to learn about the Cracker Barrel philosophy & culture and search the list of current openings. The restaurant was established by Dan Evins in 1969, with its first location set in Lebanon, Tennessee. Evins was working as a sales representative for a major gas refiner and was looking for a way to increase gasoline sales. Evins’ idea was to attract more highway travelers by creating a restaurant that looked like a typical old-fashioned store complete with local artifacts, rocking chairs and other elements that recalled the Southern lifestyle. 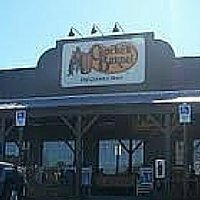 Today, Cracker Barrel is a publicly traded company with headquarters in Lebanon, TN. Cracker Barrel is active on various social media platforms. Be sure to follow and connect with them. For more information about Cracker Barrel locations and to get the latest news and updates, visit their official website. The only thing about your restaurant in Forest Park ,Ohio is the food is never server hot or even warm.. please do something about this, server need to watch for the orders to come up. The food at Cracker Barrel in Morehead, KY is too expensive for the Rib Eye steak meals. Austintown Ohio cracker barrel steak prices way too high for the portion size…plus the atmosphere is of the cafeteria style and is way too noisy!!!!! Where r u living where milk isvthat cheap lol? Its 450 a gallon here. milk is 360 in Pensacola,fl. We live in Indianapolis , IND. And go to Kroger ….Milk is usually $1.69 a gallon..69¢ a 1/2 gallon. Where in the world is milk $4.50 a gallon!!!!!!?? Love Cracker Barrel – wait staff are attentive and kind, you never have to repeat your order even though the dining area is way too loud, which interferes with the ability to hold a conversation with the rest of the table (that might be a plus, too). Menu is a bit confusing, as in what, exactly, comes with your order, but I am always surprised how much is included and how full I am and feel like a glutton after leaving. Okay, so we can all commit that sin at least once, can’t we? Yup, the devil made me go here. It is crazy noisy . I can never understand the waitresses. I always leave with a bad headache, just trying to figure out what my own party is saying. Ya’ll need to build a Cracker Barrel in Circleville,Ohio! We need a Crackle Barre in Chilton county, Alabama and soon please, please, please!!! Ya’ll need to build a Cracker Barrel in Circleville,Ohio! plenty of room south of town on Route 23 around the Walmart area! I am handicapped in wheelchair. Recently I went to my local CB. Someone in a Lincoln Navigator was parked in the middle of two handicapped places. It would appear that he was protecting his car. In addition, had no handicapped permit to park in the area. There was no other place to park at the time,. A manager came to my car and would do absolutely nothing because of “company policy”. He cited the “private property” aspect and that the company did not want to insult customers. There is a Federal law concerning handicapped parking. The mgr. could have used the Intercom to alert the offender. I consulted the top Mgr. about the problem later and he was concerned but really nothing has changed due to company policy. The law is the law and I was cast aside as if I were a non-person with no respect. The company should take a look at this issue, Handicapped people spend money. There was no “win” here. One party was respected (the offender) while I, the abused, was the one who had no right acording to “company policy”. . My legal right was ignored. if Corporate policy does indeed dictate a Manager has no discretion to address a non-handicapped person to park in a handicapped place(s), call the police. Private property or not, the law was broken. Take a picture of the offender vehicle and call the local TV stations. no-one wants bad publicity including a moronic Management team at Cracker Barrel. They no longer offer the Cracker Barrel fancy fixins sampler. I think it’s crazy to charge full price for kids drinks. They have a small cup and get charged the same as a adult. Not only that I was charged 3 49 for one kids pancake and charged more than the pancake for a kids sausage. Very very disappointed in cracker barrel. Don’t know if I ever want to go there again. Morehead, KY food was fantastic, as well as hot. Great service too. 6pm on a Thursday evening. Spent $10, tipped $5. Awesome! Always satisfied with this place. The food is a Tlways good and freshly cooked. I am fortunate to live about a mile away in Abingdon Md. Keep the campfire meal all year it’s fantastic and it will fill you up. all employees have been friendly. Keep up the good work. Prices are a little high out in the shopping area. The food makes up for it. I agree about the noise factor in all cracker barrels we have visited, and there have been dozens over the years while traveling and local. We put cotton in our ears and still too loud. Since this is a common complaint, some additional sound barriers and better insulation should be installed. Lord knows, they make enough money. We love the food, but, unfortunately, the noise factor does prevent more of our business. Also, regarding the totally ignorant people who park in handicap spaces, much less taking up 2 spaces when not handicapped at all, is but a reflection of the world today with self absorbed, all about me attitudes, and no regard for others nor the rules. I agree with the guy who said call the police since management is more worried about political correctness then God forbid offending anyone…. Very sad! I live in Fayetteville,GA(30214 Zip), there are only 3 full-serve places to eat and wall to wall fast food joints in a town of 35k population. 30 mi. SW of Atlanta. Thank You.